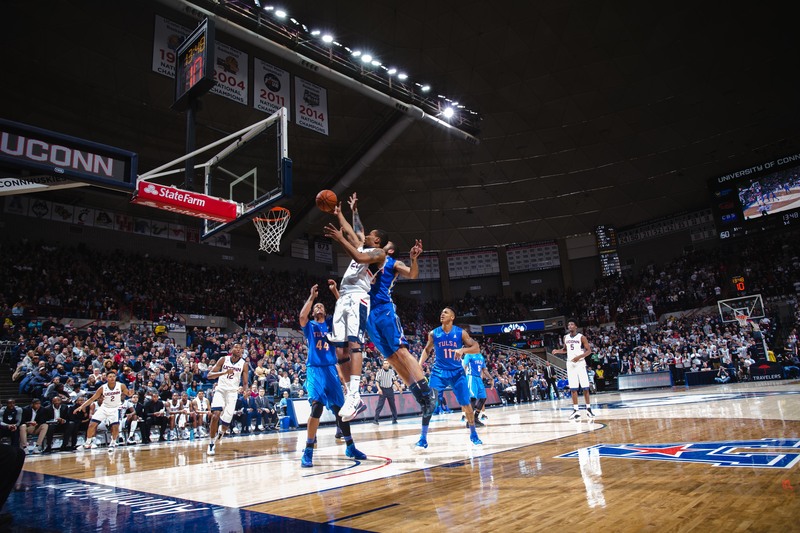 In front of a near-capacity crowd at Gampel Pavilion, the UConn Huskies (18-7, 8-4 AAC) successfully avenged a January loss to Tulsa (16-9, 8-5 AAC) and defeated the Golden Hurricane, 75-73. 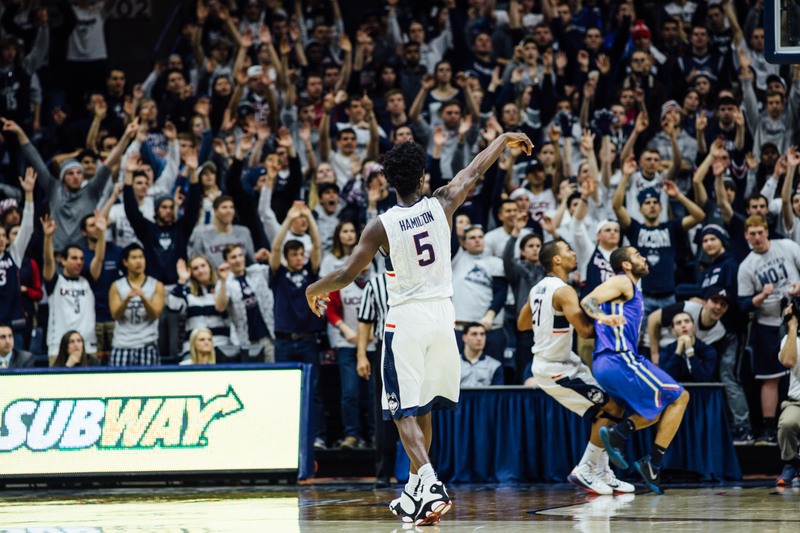 UConn was paced by Sterling Gibbs and Omar Calhoun, who both scored 14 points for the Huskies. Daniel Hamilton (12), Rodney Purvis (11), and Shonn Miller (10) also finished in double figures for the Huskies, who jumped Tulsa in the conference standings with the win. 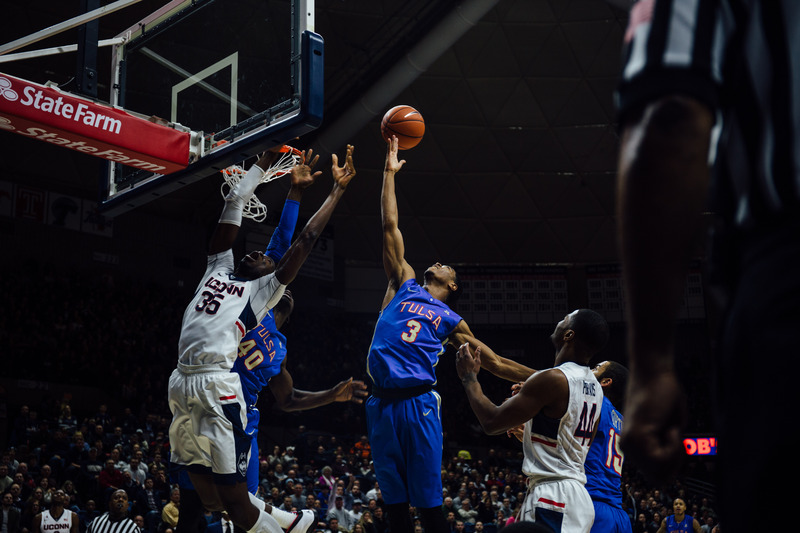 The Huskies were comfortably ahead by as many as 20 points in the second half after leading by 13 at halftime. Tulsa, however, slowly chipped away at that lead and cut the margin to eight with 6:30 to play before insanity ensued. On UConn’s next possession, Hamilton, who posted his third straight double-double, hit a three from the top of the key to give the Huskies an 11-point lead. Fourteen seconds later, Tulsa’s Pat Birt, who scored 21 of his game-high 24 points in the second half, answered with a three of his own. After a 30-second timeout, Hamilton answered Birt’s response with another make from long-range. However, Marquel Curtis, 15 seconds later this time, hit another three for Tulsa to answer right back. Thirty seconds later, with the Huskies still up eight, Birt found himself open for another three. He shot an airball, but James Woodard grabbed the offensive rebound and immediately kicked it back out to Birt who wouldn’t miss the second time. This three-pointer brought Tulsa back within five with just 4:25 to go. A Shaquille Harrison reverse lay-up brought Tulsa within three with a minute and a half remaining, but that’s as close as the Golden Hurricane would come until Rashad Ray banked in a three-pointer at the buzzer. 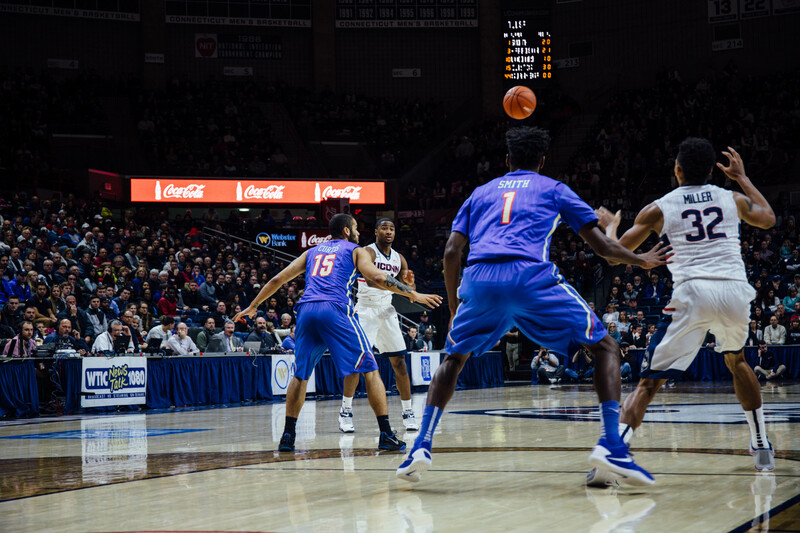 The Huskies will take on nationally-ranked SMU (21-3, 9-3 AAC) at home on Thursday night in the final game at the XL Center this season. WHUS will have live coverage beginning at 8:00 PM on either 91.7 FM or whus.org. NOTES: Sacramento King guard Caron Butler (2000-02) was inducted into the Huskies of Honor during a ceremony at halftime… UConn is 6-1 in games following a loss this season… The Huskies are 6-0 at Gampel Pavilion this year (last year = 4-4)… Miller has scored in double figures 20 straight games… Omar Calhoun made just his second start of the year… did you know: no team in NCAA Division I has more seniors on their roster than Tulsa (9)…Former player Caron Butler (2000-02) was inducted into the Huskies of Honor at halftime….